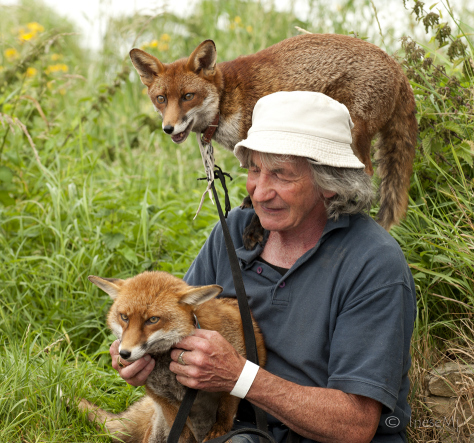 This week I visited Pat and his foxes again and took some photographs. I am reblogging my old blog post so that you can read the story again to refresh your memory 🙂 Next Friday I will share some news and pictures of this famous family. Information about the blogging rewards in the end of the post is outdated and belongs to my original post. Keep in touch! 🙂 Thank you for reading! For a moment I thought you were talking about movie companies or tv channels. I hope I can catch up on the new pictures. Beautiful! How adorable! I remember this post 🙂 These foxes are so cute and friendly – I am amazed by it! I can’t wait to see the new photos! Thank you for following up with Pat – he and his foxes are so interesting! That is so cool. I would like to see them close and pat them. Are one of the them in the picture with you in your head shot picture? What a wonderful vocation this man has. Fox hunting, or any hunting for sport, is a disgusting past time. I think Patsy is doing a great service by showing what wonderful creatures foxes are. Thank you so much for your comment! I am going to print out all the comments for him. He is doing exactly what you say – every year he takes the foxes to the local schools, and talks to the students. If fathers are killing foxes, may be children won’t. What a beautiful post. Thank for sharing this. Thank you Cindy! My favorite place to visit. Thank you Teagan! I just didn’t want to repeat the story again and made my life easier reblogging it 🙂 Hugs!!! Wonderful … can’t hardly wait for more photographs! Thank you so much! There is more news, and hopefully more stories 🙂 See you next week! Thank you! Sending smiles and hugs!! !